Intensity-modulated radiation therapy (IMRT) poses a number of challenges for properly measuring commissioning data and quality assurance (QA). Volumetric modulated arc therapy (VMAT) is a system for IMRT treatment delivery that achieves high dose conformality by optimizing the dose rate, gantry speed, and the leaf positions of the dynamic multileaf collimator. However, VMAT is more difficult technique to master because there are more variable parameters. Patient-specific dosimetry for VMAT logically demands the ideal geometry of the phantom (cylindrical or thoracic shape). These phantoms are commercially available and some phantoms have been customized. ,,, They are available with ion chambers or an array of diodes. They may or may not be available easily in the department due to economical constraints, and hence, rectangular phantoms are routinely used for dosimetry. The dosimetric results may vary due to the sharp edges of the phantom. However, no study has been reported yet quantifying the uncertainty due to the phantom shapes or geometry. Recently, Rapid Arc (RA) (Varian, Palo Alto, CA, USA) was commissioned in our institution and retrospective patient-specific dosimetry was carried out for a few patients. The objective of this study was to investigate and quantify the effect of sharp edges of the phantom on the point dose measurement during patient-specific dosimetry with Rapid Arc. Ten patients with carcinoma of prostate were randomly selected for this dosimetric study. Two phantoms were used in this study. The cylindrical phantom (diameter 34 cm, IBA Dosimetry, Sweden) was made of solid water with density 1.04 g/cc. [Figure 1] shows the cylindrical phantom. The rectangular phantom was a real water phantom (25 cm × 25 cm × 10 cm) and is shown in [Figure 2]. Both the phantoms have the provision to insert (adaptor) cylindrical ionization chamber (0.65 cc). These phantoms were pre-scanned individually in computed tomography (CT) machine (Somatom Emotions, Obersternfeld, Germany) with cylindrical ionization chamber (FC65, IBA) in place at 5 cm depth. The scans were acquired with 2-mm slice thickness and the images were transferred via ARIA networking system to the Varian Eclipse (v 8.6.14) three-dimensional treatment planning system (3DTPS). All the Rapid Arc (RA) verification plans were generated with 6 MV X-rays in the Eclipse with single arc (clockwise) on these phantoms. For this, the Rapid Arc intensity-modulated beam fluence was imported from the respective patient's plan to each phantom. The gantry angle of the arc is from 180.1° to 179.9°. The advantage of RA is its shorter treatment times compared to Helical Tomotherapy and conventional IMRT. It uses more beam directions than fixed-gantry IMRT and delivers highly conformal volumetric dose distributions in a single or multiple arcs. Progressive Resolution Optimizer was used for Rapid Arc optimization. Planned dose was recorded for both the phantoms from the Eclipse. Dose distribution optimization is performed inversely using dose-volume objectives. The optimizer is enabled to continuously vary the instantaneous dose rate, MLC leaf positions, as well as the gantry rotational speed with inter-digitization capability for a single optimized arc around the patient in achieving the desired level of delivery modulation. The Anisotropic Analytical Algorithm photon dose calculation algorithm was used for all RA cases in this study with Eclipse TPS. RA plans consisted of a single co-planar arc capable of one rotation during delivery. For single arc plans, collimator angle was fixed to 45° with a couch angle set to 0°. Collimator field size and collimator angles were determined automatically via tools within Eclipse to encompass the planning target volume. The dose calculated by TPS at 5 cm depth in central axis was noted for each verification plan to be irradiated at the machine. The plans were delivered with Novalis Tx (Varian) linear accelerator with 6 MV X-rays and high-definition MLCs (2.5-mm and 5-mm leaf width at the isocenter) for both the phantoms separately. Similar setup from the TPS was simulated at the machine with target to surface distance of 95 cm with chamber at 5-cm depth. 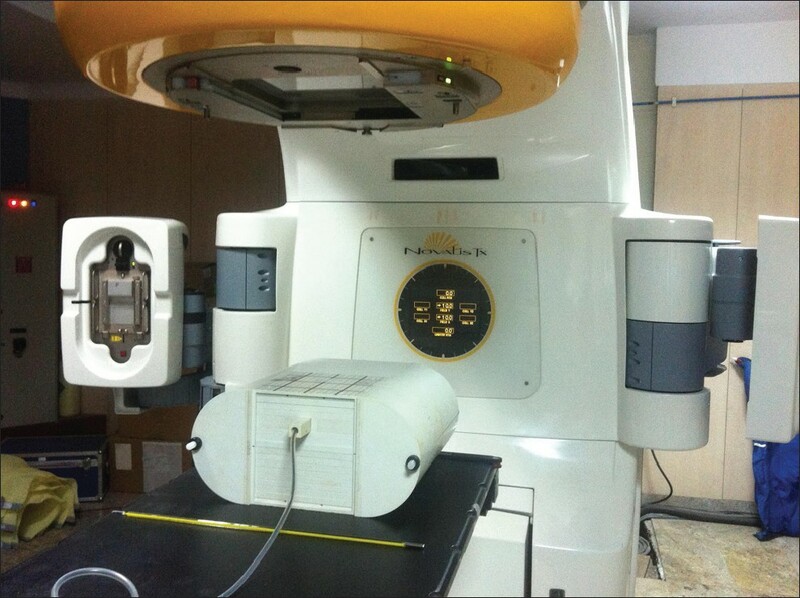 Prior to irradiation of RA plan, the output of the machine was measured by delivering 200 monitor units with 10 cm × 10 cm field size with the above setup to check the beam stability. The response from the electrometer was converted into absorbed dose after correcting it with appropriate conversion factors as per international dosimetry protocols. The dose was measured at the central axis with same chamber and DOSE1 electrometer (IBA). The measured dose was compared with the planned dose for both the phantoms. 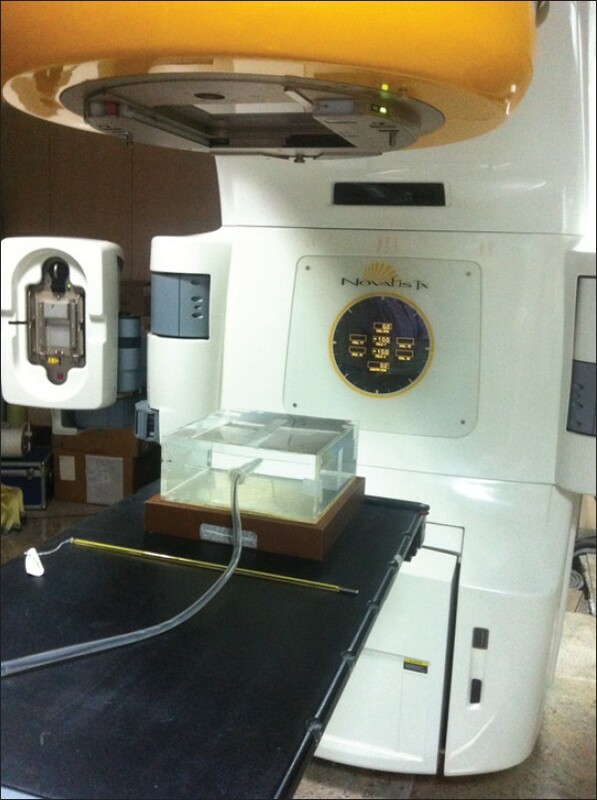 All the planes were delivered on the machine with the image-guided radiotherapy (IGRT) couch. Han et al. reported variable criteria for dose agreement (5-7%) while validating their IMRT and VMAT plans as per the Radiological Physics Centre (RPC, USA). The results obtained in our study were in agreement within 5% and comparable to this study. Park et al. reported the dosimetric results with cylindrical phantom and obtained much better results compared to 2D planar dosimetry. However, the total dose error occurring on the cylindrical surface was in the range of 5-8% for the three cases. This was a preliminary phantom dosimetric study for point dose measurements only. Although differences were noted between QA results for some plans, neither modality showed consistently poor agreement of measured and planned doses. No statistically significant differences were found for point doses measured with an ionization chamber between cylindrical and rectangular phantoms. The machine offered sufficient stability for the gantry rotation (SD 0.4°) and monitor units' delivery accuracy (SD 0.4 MU). These results demonstrate the suitability of the rectangular phantom for the patient-specific QA of VMAT plans and suggest that this phantom can also be an effective tool in the routine QA. The results agreed with the planned dose for 9 cases out of 10 cases. The high-dose gradient in the center was the reason and measurements were carried out at off-axis. The agreement between measured and planned doses was within 5%. The setup time for both the phantoms was less than 5 min. In IMRT and VMAT, the use of posterior oblique beams has become common. Beam attenuation by the treatment couch is not negligible when the couch is in the beam portal. Li et al., in their study, established the relationship of relative dose versus beam angle for two Varian 21EX linacs, one equipped with the Exact couch (standard couch) with sliding side support rails and the other equipped with the Exact IGRT carbon fiber couch. Measurements were performed using an ion chamber placed at the center of an acrylic cylindrical phantom. For oblique fields with 6 MV photons, the standard couch attenuated the radiation beam by up to 26.8%, while the carbon fiber IGRT couch attenuated the beam by up to 4.1%. In the clinical evaluation, the highest dose difference between rails set at the "in" and "out" positions was 2.1% in the VMAT case. The magnitude of potential dose difference due to couch attenuation in our RA plans was also studied. In our study, Exact IGRT couch was used for dosimetry and the couch rails were set at the "in" and "out" positions for five cases each. Thus, it is necessary to incorporate the couch in TPS for calculation. The effect of sharp edges on the point dose measurement during patient-specific dosimetry with Rapid Arc was investigated and quantified for 10 patients with both the phantoms. The sharp edges of the phantom do not perturb the patient-specific Rapid Arc dosimetry significantly. The results demonstrate the suitability of the rectangular phantom for the patient-specific QA of VMAT plans and suggest that this phantom can also be an alternative tool to cylindrical phantom in exceptional cases for the routine QA. Systematic patient-specific planar dosimetry for more number of cases with complex tumor shapes will be carried out in future. 1. Park JY, Lee JW, Choi KS, Lee JS, Kim YH, Hong S, et al. Development of a novel quality assurance system based on rolled-up and rolled-out radiochromic films in volumetric modulated arc therapy. Med Phys 2011;38:6688-96. 2. Létourneau D, Publicover J, Kozelka J, Moseley DJ, Jaffray DA. Novel dosimetric phantom for quality assurance of volumetric modulated arc therapy. Med Phys 2009;36:1813-21. 3. Low DA, Moran JM, Dempsey JF, Dong L, Oldham M. Dosimetry tools and techniques for IMRT. Med Phys 2011;38:1313-38. 4. Bedford JL, Lee YK, Wai P, South CP, Warrington AP. Evaluation of the Delta4 phantom for IMRT and VMAT verification. Phys Med Biol 2009;54:N167-76. 5. Almond PR, Biggs PJ, Coursey BM, Hanson WF, Huq MS, Nath R, et al. AAPM's TG-51 protocol for clinical reference dosimetry of high-energy photon and electron beams. Med Phys 1999;26:1847-70. 6. Mancuso GM, Fontenot JD, Gibbons JP, Parker BC. Comparison of action levels for patient-specific quality assurance of intensity modulated radiation therapy and volumetric modulated arc therapy treatments. Med Phys 2012;39:4378-85. 7. Lafond C, Jouyaux F, Bellec J, Henry O, Perdrieux M, Chajon E, et al. Which IMRT? From "step and shoot" to VMAT: Physicist point of view. Cancer Radiother 2010;14:539-49. 9. Mihaylov IB, Bzdusek K, Kaus M. Carbon fiber couch effects on skin dose for volumetric modulated arcs. Med Phys 2011;38:2419-23. 10. Li H, Lee AK, Johnson JL, Zhu RX, Kudchadker RJ. Characterization of dose impact on IMRT and VMAT from couch attenuation for two Varian couches. J Appl Clin Med Phys 2011;12:3471. 11. Feygelman V, Zhang G, Stevens C, Nelms BE. Evaluation of a new VMAT QA device, or the "X" and "O" array geometries. J Appl Clin Med Phys 2011;12:3346. 12. O'Daniel J, Das S, Wu QJ, Yin FF. Volumetric-modulated arc therapy: Effective and efficient end-to-end patient-specific quality assurance. Int J Radiat Oncol Biol Phys 2012;82:1567-74. 13. Masi L, Casamassima F, Doro R, Francescon P. Quality assurance of volumetric modulated arc therapy: Evaluation and comparison of different dosimetric systems. Med Phys 2011;38:612-21. 14. Han Z, Ng SK, Bhagwat MS, Lyatskaya Y, Zygmanski P. Evaluation of MatriXX for IMRT and VMAT dose verifications in peripheral dose regions. Med Phys 2010;37:3704-14. 15. Schreibmann E, Dhabaan A, Elder E, Fox T. Patient-specific quality assurance method for VMAT treatment delivery. Med Phys 2009;36:4530-5. 16. Létourneau D, Publicover J, Kozelka J, Moseley DJ, Jaffray DA. Novel dosimetric phantom for quality assurance of volumetric modulated arc therapy. Med Phys 2009;36:1813-21.